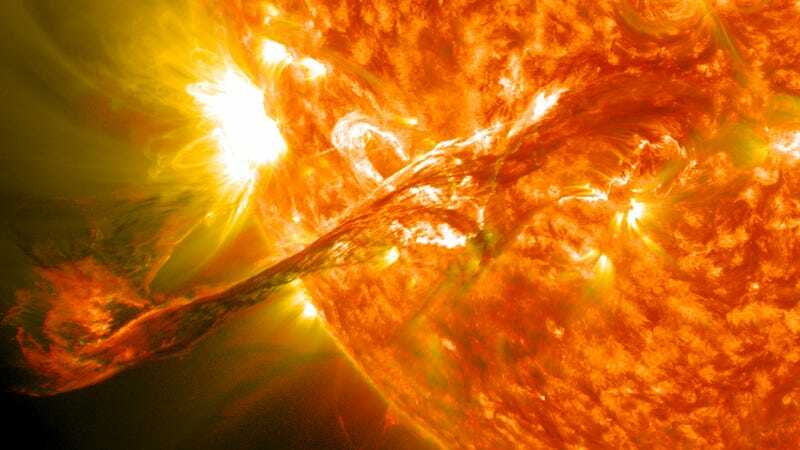 Every 100 years or so, our planet is bombarded by an intense solar storm. These extreme space-weather events are virtually impossible to predict, but new research shows which regions of the United States are at highest risk. A new study published in Geophysical Research Letters is the first to provide a geoelectrical hazard map for the continental United States. Though incomplete, the map shows some of the areas within the US where geoelectrical fields produced by an incoming solar storm would damage the electrical power grid. The new research, led by geologist Jeffrey Love, is an important contribution by the US Geological Survey to an interagency initiative called Space Weather Operations, Research, and Mitigation (SWORD), which was initiated by the White House’s National Science and Technology council last year. 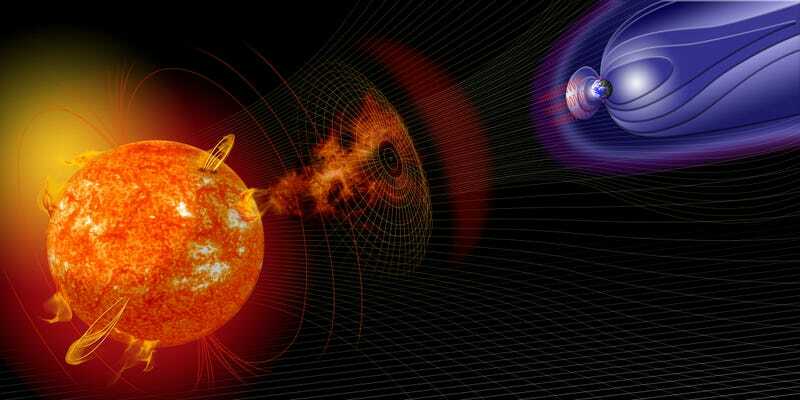 Solar storms have happened before, and they’ll likely happen again. One of the most severe storms to hit our planet was the Carrington Event of 1859, which caused damage to the few electronic devices that existed at the time, namely telegraph systems. We’ve been hit by other geomagnetic storms since then, including events in 1921 and 1989. Given the scope of our current technological infrastructure, it’s been estimated that the next Carrington-scale event (which happens roughly once every 100 years) will cause upwards of $2.6 trillion in damage across the globe, and require four to ten years for complete recovery. When a geomagnetic storm hits the planet, its effects aren’t equally distributed; factors above the atmosphere and within our planet’s crust act as force multipliers. To figure out which US regions are most vulnerable, Love’s team considered two variables: the rate of geomagnetic activity above a given area, and the extent of magnetic materials beneath the Earth’s surface. To that end, the researchers looked at real-time geomagnetic data collected by the International Real-time Magnetic Observatory Network (INTERMAGNET) consortium, and magnetotelluric survey data collected by the NSF’s EarthScope program (which measures subsurface electric conductivity). Taken together, these two sets of data allowed the researchers to create their map. Each dot corresponds to a magnetotelluric survey site. Red and black dots represent areas with the greatest hazards, while yellow and green show the lowest hazards. Looking at the map, Minnesota and Wisconsin are at highest risk (and by inference, probably north western Ontario). The blank spaces on the map are where magnetotelluric surveys have not yet been conducted. [A] high-priority area is the northeast United States, a region that includes several major metropolitan centers and corresponding electric-power grid infrastructure, all of which are situated on top of complicated geological and tectonic structures and at latitudes where geomagnetic activity can be locally intense. In some areas, such as in northern Minnesota (MN) where local geological and tectonic structure evidently results in geoelectric fields of great geographic complexity, detailed magnetotelluric surveys might be necessary. 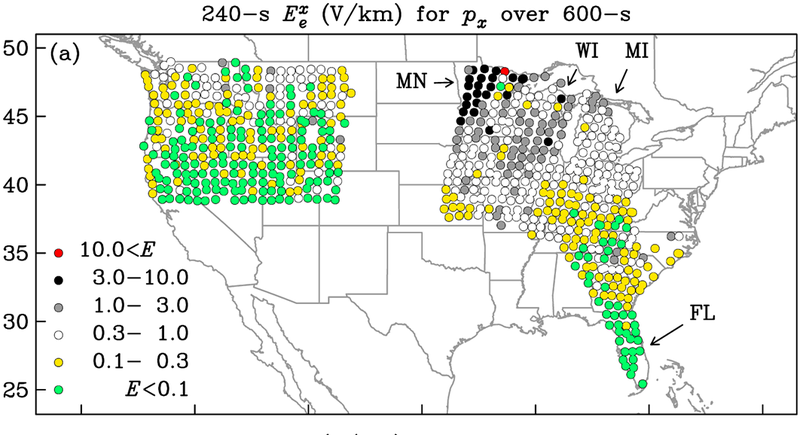 Additional geomagnetic monitoring and a magnetotelluric survey of southern Canada would lead to improved hazard mapping in the Northern United States, and it would enable risk assessment of integrated North American continental, electric-power grid networks. No doubt—the stakes are high, so we better get a handle on the risk, and what we need to do to prepare for the next big solar storm to hit our planet.